New opportunities and further developing international links to attract more yachts to visit and provide more business to the Australian marine market were among the topics included in the second day of the ASMEX 2018 Conference. 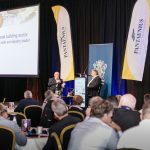 ASMEX 2018 – the Australian Superyacht, Marine Export and Commercial Marine Industry Conference entitled “Changing the Game down under – Australia has it all”, is a leading annual event in the Asia Pacific marine leisure industry calendar. It was held at the Intercontinental Sanctuary Cove Resort on May 22-23, 2018. The content of ASMEX 2018 provides updates on the work of AIMEX- the Australian International Marine Export Group, Superyacht Australia and the Australian Commercial Marine Group(ACMG). 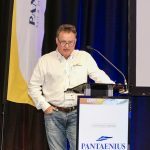 The second day’s program started with an informative update from James McPhail, Managing Director, Pantaenius Australia, of the Australian boating industry from an insurance perspective. This in particular dealt with post Tyhoon Debra storm and the issues raised by that, especially how boat owners prepare their boats for fierce storms. He explained that as a result of the storm and the hurricanes in the Caribbean in 2017 that a number of insurance companies had withdrawn from the market and that obtaining insurance coverage was going to be more difficult and expensive in the future. As to Pantaenius, McPhail indicated that out of 110 claims, only a few have not been settled. The value of international alliances in generating business and promoting key brands was a subject addressed by Peter Mahony, the General Manager of Benetti Asia. He explained Benetti’s position as the leading global builder of superyachts over the past 18 years and gave details of the 18 yachts between 28 and 60 metres it has in Asia Pacific including two new deliveries in 2019. Regarding Australia he spoke of Benetti’s links with Geoff Lovett and the Gold Coast City Marina & Shipyard as its regional service partner. He talked positively about his task of selling more Benetti’s in Australia and Asia Pacific and also of building links and partnerships with local marine suppliers and service providers. This presentation talked about a number of potential actions that might be tried to expand business for Australia’s marine industry based on marketing, promotion plus developing new business links. Marketing, based on a single page plan, was the core of an entertaining presentation on how to manage and implement your marketing by Franziska Iseli. This Swiss-Australian lady has set up a number of business including one called Oceanlovers. The current state of the US market and the similarities between the American and Australian markets was explored by Kitty McGowan, the President of the US Superyacht Association. With the growth of the US Northwest Pacific boating market the case was made that this might be a growth opportunity for Australia and that relevant promotion could produce positive results. Stronger USSA-Superyacht Australia links were seen as an integral part of this. Bill Barry-Cotter, the doyen of the Australian boating industry was the focus of an informative interview undertaken by Superyacht Group Chairman and Editor-in-Chief, Martin Redmayne. This gave an insight into the various businesses that Bill has been involved in over the years and especially his current ownership of the successful and expanding Maritimo brand. 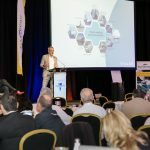 The America’s Cup had already been highlighted as an important opportunity for Australia on Day one of ASMEX 2018. New Zealander Clint Jones, who runs the Oceanmax brand, spoke of his involvement in photographing the Cup races and also various marketing and business initiatives that he has been involved with. An update on where the plans for the America’s Cup 2021 was presented by Peter Busfield, Executive Director of the New Zealand Marine Industry Association. He gave the latest information of plans for the facilities to cater for the teams and the provision of 92 berths for visiting superyachts. He also gave details of a number of promotional events and of the America’s Cup schedule for the race programme and other events associated with them. He also emphasised that the Cup would present a big opportunity for Australia and that the good links between the Australian and New Zealand associations would provide the means by which the latest information would be given. The final conference presentation was made by Chris Lloyd, Vice President-Maritime for Thales Australia. He spoke of the extensive investments being made in new facilities for the Australian naval fleet which would also be available to meeting the needs of commercial ships and possibly superyachts. His presentation included information of Thales Australia developing new facilities in Newcastle and possibly Darwin and Cairns. Thales Australia is a business that now employs 36,000 people and has seen its revenues grow from A$15 million to A$300 million over the 30 or so years that it has been in the country. To end the successful two-day ASMEX 2018 Richard Chapman, President of AIMEX gave a summing up and thanked the speakers, sponsors, master of ceremony and the AIMEX team that had done all the administration and organising work behind the scenes.